Danny Bowien has already made a name for himself with Mission Chinese Food (MCF). Since launching the cult favorite in San Francisco two years ago, the young chef has been earning praise for his updated take on Sichuan cuisine. MCF’s newly christened and much anticipated first New York City outpost, open for exactly three weeks now on the Lower East Side, began drawing crowds early on. I headed over on Sunday afternoon with my Veganaut friends, no reservations (literally), on a hope and a prayer and found that we have great timing. After learning there was no wait for a table, our host lead us through a long-ish corridor, past the kitchen and up a small flight of stars to a tucked-away dining room complete with a bar. My only advice: If you’re heat-sensitive, pay attention to the flames on the menu when ordering—they’re there for a reason. With the exception of the Fresh Tofu Poached in Soymilk, Beijing Vinegar Peanuts and the Wild Pepper Leaves, everything we ordered was super-hot; but as far as I’m concerned that heat served as a necessary part of the flavor. I had my dSLR camera with me but was too distracted by the good food and conversation (and maybe admittedly still a little chicken to use it while out dining). I did manage to snap a few shots of the table with my iPhone during and after our meal, though. 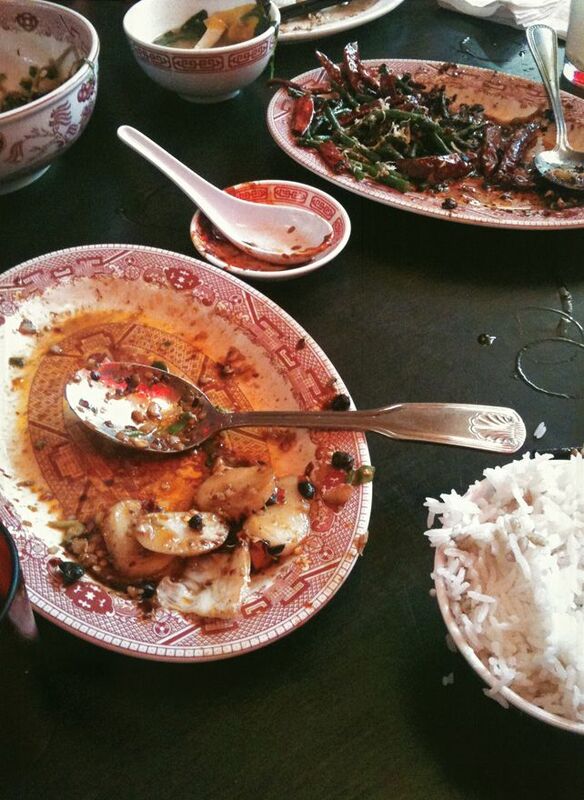 Visit Mission Chinese Food NY at 154 Orchard Street, between Rivington and Stanton; and online at http://www.missionchinesefood.com/ny/. Read more about Danny in the May 2012 issue of Bon Appetit.